According to the World Health Organization (WHO) antimicrobial resistance is an increasingly serious threat to global public health that requires action across all government sectors and society. 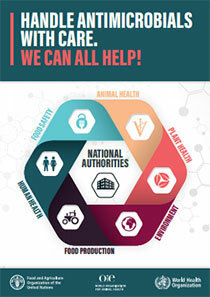 The Codex Alimentarius Commission agreed in July 2016 to re-establish the Intergovernmental Task Force on Antimicrobial Resistance in order to revise and update the Codex code of practice on AMR and, for the first time, to set guidelines for integrated AMR surveillance that can be adopted by Codex members. The re-established Task Force meets for the first time today on Jeju island in the Republic of Korea, chaired by Yong Ho Park, Professor of veterinary medicine at Seoul National University. “Codex is the coordinator in the farm to fork process” he said, describing the central role Codex performs dealing with food safety as the chain moves on to food security and human health. Steve Wearne is Director of Policy and Science Group at the UK Food Standards Agency and Vice Chair of the Codex Alimentarius Commission. He also chaired the 2016 Codex physical Working Group on antimicrobial resistance in London. The work being undertaken in Codex can be taken up by countries “in a stepwise manner to reflect their capabilities. These new texts (will) complement the national plans that many countries are developing, rather than distract from them,” he said. Antimicrobial drugs play a critical role in the treatment of human, terrestrial and aquatic animals, and plant diseases. However, the inappropriate use of antimicrobials, e.g misuses ad overuse, in the livestock sector, in aquaculture as well as in crop production can contribute to the potential risk of the emergence and spread of antimicrobial resistant micro-organisms. (FAO).